Order your Golf Sportwagon 4Motion or Alltrack at Clarkdale Volkswagen. Update Feb 2017: Great news! The Volkswagen Golf Alltrack was just crowned Canadian Car of the Year by the Automobile Journalists Association of Canada! There were a lot of Alltrack inquiries over the past few months. Come on by and take it for a spin! At long last, Volkswagen’s 4MOTION all-wheel-drive system will finally be made available on the Golf Sportwagon for all trims and for the Alltrack! Hooray! Read below for info on what makes this AWD system special, and for what makes the Sportwagon special in the first place. 1 | So what’s the big deal with VW’s 4MOTION AWD system anyway? 4MOTION uses a fifth-generation Haldex AWD system. This system features (take a breath now) “a new electro-hydraulic clutch actuator that uses a centrifugal overflow valve design aimed at accurately distributing power between the front and rear axles, eliminating the need for an accumulator, solenoid valve and filter. It also employs an integrated electronic control unit.” Okay. What that means is the system simpler than the previous 4th generation, while still providing everything it did; namely, split-second calculations that divert power away from wheels with less traction and towards wheels with more traction. This means that under normal driving conditions, the system functions as a regular front-wheel-drive drivetrain for the benefit of fuel economy. However, when things get even a little bit hairy, power in instantly redistributed among the four wheels so as to make things decidedly less hairy. 2 | Why are 4MOTION and the Sportwagon such a great fit? People who purchase wagons usually have “versatility” high up on their list of automotive priorities. By adding AWD to the already-versatile Sportwagon, the versatility is veritably off the charts! Roads that used to be off-limits to a wagon are now green-lit! This is great news for anyone who needs the utility of a compact sport utility vehicle, but craves the cornering ability of a sports sedan. 3 | Does the Golf Alltrack offer anything additional over the Golf Sportwagon 4Motion? Indeed it does! Functionally, the Golf Alltrack offers are a raised suspension setup to compliment its AWD drivetrain. 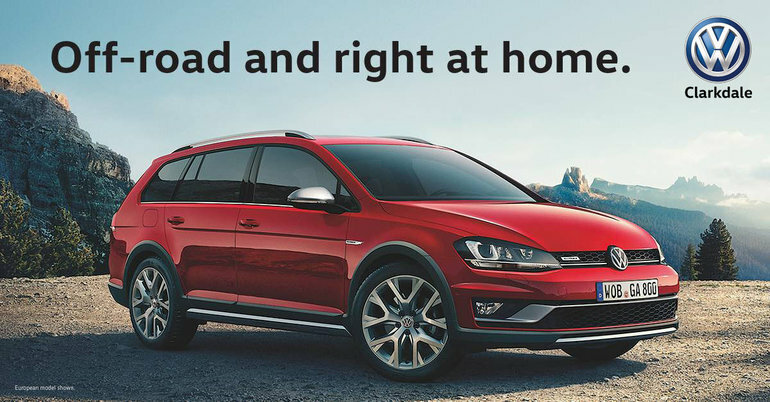 Aesthetically, the Alltrack features badass 18” Canyon wheels, “AllTrack” badging inside and out, and a re-designed bumper and grille with colour-matching side mirrors, steel pedals and driving profile selection. 4 | Why a wagon over a compact sport utility vehicle? Great question. Both vehicles appear similar on paper, and in fact most people who by a Sportwagon or a Tiguan end up checking the other one out at some point. Both offer spacious seating for five, similar cargo space, and a sporty driving experience. But they are very different! Generally, the Sportwagon is down on cargo space and up on sportiness compared to the Tiguan, and this is often a major factor in the final decision; people who end up going with the wagon tend to prioritize its low-slung sportiness over the Tiguan’s ruggedness and extra cargo space. It should also be said that wagons have a particular image that very often factors into the decision. Wagons are relatively unique compared to more ubiquitous sport utility vehicles, and subsequently, have a more “alternative” image. This is often reflected in the people who buy Sportwagons. And within the enthusiast community, wagons are cherished as the utility vehicle of choice, blending the right amount of utility with the right amount of sportiness, all mixed with a dash of quirkiness. We love it all. 5 | What engine and transmission combos will be available on the Golf Alltrack? The sole engine option will be the 1.8L turbocharged 4-cylinder, making 170 hp and 184 ft-lbs torque. As for transmission, initial orders will be limited to automatic. 6 | Just how “accommodating” is the Golf Alltrack’s interior? Well, to put a number on it, 66.5 cubic feet accommodating. That’s with the rear seat folded. But even when three adults are sitting there (which, at 903 mm of legroom, is actually quite comfortable), there’s still 30.5 cubic feet of cargo space. A 60/40 folding rear seat and a ski-pass slot puts the number somewhere in between. So whatever you’re thinking of taking with you, it will probably fit. 7 | What about tech? The 2017 Golf Alltrack’s infotainment system is called Discover Pro. It combines next-gen navigation, in-car media entertainment and App Connect functionality that allows you to connect your chosen device: Apple CarPlay, Android Auto, or MirrorLink. The system is easy to use, offers voice commands and features a huge 8” touchscreen display. 8 | What about the Golf Alltrack’s safety features? The Golf Sportwagon has just won AJAC’s Best New Family Car Award (the previous generation Golf Wagon also won this award), and you don’t win such awards without being up to date on all safety features. The 2017 Alltrack will have all of the same safety features, including a built-in safety cage system, a forward collision warning system, a post-collision braking system, many airbags, a rearview camera, electronic stability control with predictive anti-skidding technology, and an intelligent crash response system. 9 | So… When and how much? Finally, it’s a safe bet that these Golf Alltracks will be in high demand, especially during the initial rollout. If you like the sound of an AWD wagon, you can put a (refundable!) deposit down to ensure you have access to the exclusive first wave of Alltracks. To do so, contact us at 604-872-5431 or fill the form below with your choice of colour and options!